This elegant bouquet, with blue Iris and mixed purple and white Eustoma blooms, will enchant princesses large and small, but is also fit for a king. These rich colours are sure to delight and impress and are appropriate for all occasions. 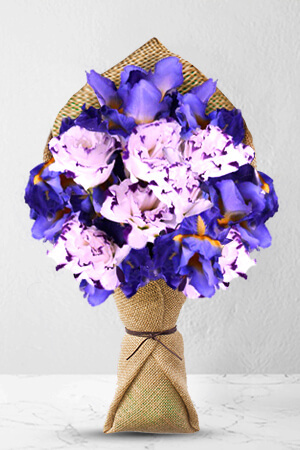 Send this gorgeous bouquet today.Our bouquets do not include a vase. However, adding Premium vase to your gift will give Alexis that extra boost of passion. Flowers arrived on time, with water, and looked beautiful. My sister was thrilled to receive them. Although the florist could not locate address of recipient you at Ready flowers kept us informed, so we are pleased with result and your customer attention, thank you. All worked out. Good viewing of flowers available. Excellent variety. Delivered on time. Always reliable....always on time!!! Never any issues....put in my order and know that it makes delivery every time!!!!! Thank you zFlowers.com!!!!! My first time with zFlowers.com - my friend was delighted with the flowers and I simply couldn't fault your after-hours service, well done and many thanks.